It was when I was seventeen years old. I had the good fortune to read a book called Inshitsu-roku, by Professor Enryohan, a noted scholar of the Ming Dynasty. This is a book of instruction which the professor compiled for his son, Tenkei. The term 'inshitsu' means to be decided without one's being aware of it. That is to say that the fortunes - sunshine and shadow, ups and downs - wich befall a person are naturally determined, without his knowing it, by his own past actions, virtue and vice. Upon carefully reading this book, it became clear to me that there is a path to be followed, and I resolved then to follow that path. According to the book, Professor En first came to deeply believe in karmic retribution through a fortune-teller named Ko. He then met with Zen Master Unkoku who impressed upon him that karma is only one side of the picture, Thus he writes his son, Tenkei, that one can take responsibility for the construction of his own world. It is not a matter of living out one's life wedged into a predetermined mold, but rather, by virtue of one's own efforts, it is possible to move, if even just a step, closer toward one's aim. From childhood on, as though in search of something, I was always a rather rebellious youth. In junior high school, I kept thinking that I had never really been given the opportunity to understand the reason for living. I did not much care for Buddhist priests. I had the preconceived idea that they wore funny clothes, talked a lot of nonsense, and led lives of comfort and ease. But this book really addressed itself to that 'something' I had been searching for since childhood, and it surprised me to realize that the lesson came through a priest. Although Inshitsu-roku is at heart Confucian, not Buddhist, it is a Zen master who clearly points the way. And, incidentally, the man who translated the book, Harada Sogaku Roshi , was to become, five years later, my Zen teacher. When I was eighteen or nineteen years old, I resolved to become like a chair. That was because a chair doesn't refuse its services to anybody; it just takes care of the sitter and lets him rest his legs. After it has served its purpose, no one gets up and thanks or offers words of kindness to the chair. It will more likely get kicked out of the way. What's more, the chair doesn't grumble or complain or bear a grudge, but just takes whatever is given. When there is a job to be done, it puts forth all its energy without picking and choosing according to its desires. I was thinking, "wouldn't it be great tohave such a heart." I wrote on a big sheet of paper, "Be like a chair", and everyday took note of how-close I came. If even a little dissatisfaction arose, I would regard that as an embarrassing state of mind for a chair. I considered how thoroughly I was of use to others. A chair doesn't plop itself down on top of the sitter, right? What was positive about all this was that, if I possibly could, I wanted to put others before myself. The endeavor was not at all forced or unnatural; it arose from life itself and was enjoyable, not painful. During the time I was following this practice, I went to climb Mount Kinpoku, a rather small mountain of the Jukkoku Pass at Yugawara. As I climbed that day, I could think of nothing but my own selfishness. Shedding tears, I repeatedly reflected and repented, "I'm no. good, I'm no good," as I made the thirty minute ascent up the mountain trail. There was a large stone statue on the flat crest of the mountain. If I saw it today, I might know what it is, but at that time I had no idea. Along the way there had been a number of figures of Kannon, so I think perhaps this statue was of Shakyamuni Buddha. But in those days I knew nothing of Buddhism or of paying homage to its founder. I had, however, committed to memory the rules of Professor Shoin Yoshida's preparatory school 2) , and I began to chant those rules. Through chanting, I must have entered into a purer state of mind. I crossed to the other side of the mountain, which formed a precipice. A valley had been gouged out below, and beyond the valley stretched the Pacific Ocean. To one side I could see the rolling hills of the Izu Peninsula. Transfixed by the mountain landscape, the wind blew into me from the valley floor, and I felt as if I were growing bigger and bigger. In retrospect, we could say that I was experiencing the reality of being one with and cared for by all things of this world, experiencing the greatness of the life I have been given. But at the time, I just felt myself becoming bigger and the sensation of being protected by everyone. At that point I couldn't contain myself anymore, so in a giant voice I shouted my name seven or eight times into the far-off horizon. Since that time, a bright and changed world unfolds before me. For one or two months after the experience, everything, down to the pebbles along the roadside, brilliantly glistened. It is an intimate, friendly life. I remember well being filled with the knowledge of being together, part of the same life. At the time I still knew nothing of zazen and such, but the walls separating me from others had collapsed. My life had become a world somehow without discrimination, so I felt as if I could even chat with the chirping sparrows. Later, when I began to do zazen, I could receive the teachings of my master, which I had sought since childhood, with a ccmpletely open and receptive mind. I was quite willing from the beginning to die. Like everyone else at the time, I felt itwas only natural to give my life in the war cause. But although I repeatedly found myself in perilous situations, including one year as a prisoner of war, I always, mysteriously and narrowly, escaped. From that time on, whether or not my actions were recognized or appreciated by those around rne, the feeling that I had to put all of my efforts into what I knew I had to do became stronger and stronger. Then, in Showa 21 (1946), I began Zen training as a layman, and in Showa 24 (1949), I was ordained as a priest. The single most fundamental point in the buddhist sutras is 'taking refuge', or 'namu' in Japanese. This taking refuge in the three treasures - buddha, dharma and sangha - forms the foundation for all the precepts. To receive the Triple Refuge is to enter into the world of buddha. The Sanskrit term 'namu' and the Chinese term 'kie' both express the same spirit, and both terms mean to go back to your true home. To really go back home, in the spirit of 'kie', one must entrust oneself and let go of the body and mind that he has up to now called 'me'. If that thing we refer to as 'me' exists, then 'namu' means to give it all up for the sake of truth. So 'namu' and 'kie' are the Sanskrit and Chinese expressions which mean to place one's full reliance, body and soul, on buddha. Now, when we chant, "Namu kie butsu" - "I take refuge in buddha" - what do we mean by 'buddha'? What is buddha? This is the question the person practicing comes to feel he must answer for himself. If we are not clearly aware of the reality of a buddha, an awakened being who has thoroughly cast off everything to the last, we cannot really let go ourselves. So the question is: who, or what, or in what form is buddha to be found? First of all, is there really anything of truth in this world for which you could let go of everything? If such a truth really does exist, I would say that you could surrender everything for it. Going further, if this truth happens to be just the thing you are most seeking, then the more willingly you will let go of everything for it. Finally, we could say that what we most ardently wish for is to possess everything without exception, to have everything as one's own. If this truth is just such an all-encompassing state in itself, then you wouldn't hesitate to give up everything for it. Our desires are not such that we can say, "Oh, just to right here will be plenty." Desire being insatiable, we cannot be satisfied until we have it all, to the very last. Some gentle-mannered souls may act with reserve and declare that they have plenty. But should you ask them, "Is this really enough? ", they will likely answer, "Well, if possible, just a touch more." However, if you know that regardless of what you seek, your every wish will be granted, you will be willing to lay down your whole self. If whatever you seek is yours, isn't it correct to say that there is no loss? If a child is asked to name the one thing that is of most value, he will answer that it is 'life'. There is awareness of life. If there is a life which cannot be lost for all eternity, you would gladly give up everything for it. And then there is material wealth. If by simply wishing for something, it is provided, why should you hesitate to give up anything? Finally, if you know that you will be released from all restraints, to live in perfect freedom, I would say it is all right to give up everything for that. If these three conditions can be yours, I believe you will be ready to cast off your small self. We can say that that which is called 'buddha' is in itself the perfect embodiment of life, wealth and freedom. Eternal life as one's own, complete freedom in everything, possession of all the truth of this world - if you know this is buddha, the heart which entrusts itself cannot help but well up. When you examine yourself, you find that something is missing. Or even if you feel fulfilled now, you are anxious that this contentment will be snatched away. You feel that you just have to find something more stable. At this time buddha's existence cannot help but be revealed to you. Although buddha mind is variously revealed through each individual's own talents and gifts, buddha is now, here. But where is 'here'? One master answered this question saying, "Help yourself to tea." Another pointed 'here' when he commented, "What fine weather today." That which we most deeply yearn for is the thing that is already most fully present, already the very closest to us. Thus our ancestral teachers, according to their own circumstances at hand, have always shown that buddha is now, here. So we place our focus now, here. While what you seek is really now and here, you habitually think of it as somewhere out there, outside yourself, so you search and search in vain. What you are looking for is already wholly and completely yours. There is nothing miserly about it; it knows no limits. You are the master of this life. When you sincerely take refuge ('namu') now and here, you will find yourself in what is most secure, in that which the heart most ardently yearns for - in pure, essential buddha nature. Perhaps you wonder if we do zazen in pursuit of that which we most want. No, we do not. Doing zazen is buddha. Doing zazen is already the full expression of buddha nature. We are quickly caught up in the form of things, readily pulled in by what others have to say. This is such that if you are told, "Hey, doing zazen is buddha", you might readily respond, "Yes, doing zazen is buddha, isn't it?" In that case, I will have to say, "No, you are wrong." At a gathering of Pure Land Buddhist adherents in a training center in Kyoto, the head priest delivered a sermon in which he said, "Just as it is, just this is salvation. Salvation is just this." A follower responded to this saying, "Just as it is, this is salvation, isn't it?" The priest answered, "You are mistaken," and continued to expound the dharma,coming around again to say, "All right? Just as it is, this is salvation." Another participant repeated his words, "Just as it is, this is salvation, isn't it?" Everyone was off the track. The priest continued speaking. "Everyone has listened well. All right? Just as it is, this is salvation," he reiterated. At this, one believer in the audience shouted, "Thank you!" and made a deep prostratian. The priest nodded broadly in response. "Good," he said, and ended his talk. In sum, if one grasps at this salvation, which is just as it is, he is already counter to its truth. Zazen is just like this. When one is doing zazen, a thing called 'the self' does not put in an appearance at all. It is interesting to observe what a great discrepancy there is between theoretical understanding and truth itself. Take a dumpling, for example. Without actually sampling it, any explanation, regardless how thorough, would give only a rough idea of the flavor of that dumpling, but never its essential taste. Without actually chewing it, you cannot know its actual flavor. Depending on what we are eating, our individual way of tasting it may differ, I suppose, but the fact of having really experienced the taste is the same with everyone, isn't it? The reality of really tasting that dumpling is about the same regardless of whether you are eating it for the first time or if you are an old hand at eating dumplings. Zen is just like this. From the first time you sit, you can fully experience the flavor of zen. For a thousand people who decide to sit, there are a thousand motives and wide disparity between depths of aspiration. The main thing, however is to awaken to one's true self. This true self is supreme and irreplaceable, and we can call it 'buddha'. Of course one's true self is not that which we ordinarily conjure up in our heads and habitually regard as 'self'. It is, rather, the genuine self which cannot he grasped, seen or spoken of. So the main thing is just to become aware of this self. We can speak of seasons in the process of coming to self knowledge, and we can say that opportunity ripens. There is the unawakened season, the season when one comes to know of the existence of this reality, the season when one believes in the teachings, the season when one believes and therefore mindfully keeps one's awareness constant, and, finally, there is the season in which one is awakened. We have the expression, 'ichi tantei'. NOW. NOW. This is 'ichi tantei'. A teacher is one who clearly reveals this to the student. "Reality is not off someplace else, away from right now and here. NOW. HERE. Don't be careless. Don't be off guard." The teacher points out the path, the direct route, in the way most appropriate to each student. With this direction, the student can truly practice the most treasured, straight path. To maintain this spirit of practice, the student single-mindedly works to make the 'tantei' constant so that everything is his daily life becomes this practice, this research into his true identity; everything becomes zazen. This is truly being alive. When one settles into this 'ichi tantei', regardless of the job he has to do in this world, his efficiency increases manifold. This is because his practice becomes doing solely whatever he is doing, so that distractions do not arise. Therefore, in whatever circumstance he may find himself, his efficiency is increased. It is such that he even comes to wonder how it is this world is taking such good care of him. Living in truth like this is wonderful! Completely enveloped in and succored by the whole universe, you are like the mountains, like the seas, like the great sky which knows no limits. This great, big boundlessness is your own mind, 'Big Mind'. To awaken to this Big Mind, just do whatever it is you are doing right this moment with your whole heart. If you do with all your might, this world will, without fail, reveal itself to you. This hard little lump of 'self' will dissolve, and you will inevitably awaken to Big Mind. 'Joyful Mind' is the mind that cannot help but feel gratitude. It is not that you feel thankful because you are supposed to feel thankful, but rarther that you cannot help but feel thankful. You feel so much gratitude that it spills over as joy. And then from that boundless joy, kindness arises, kindness which is born from thoroughly exhausting all of one's small self and merging to become one with others. This is 'Parental Mind'. When Big Mind, Joyful Mind and Parental Mind come together as one body, just this in itself is Bodhissatva Mind. And isn't this, indeed, the very basis of all education of our children? Shakyamuni Buddha and the patriarchs teach the fundamentals of education in this way. Each child is from the first the master of Big Mind. If this heart is encouraged to spring forth, the child will naturally become cheerful, and problems will take care of themselves. The child will become a human being who is sensitive to the pain of others. Sensitivity to others, joy which flows of itself - these functions of life itself are gradually cultivated. No matter how much you study, how many books you read or how much theory you learn, this kind of knowledge can only be an aid, but never the driving force, toward peace of mind. And actually, if one is not careful, theoretical excercise can even be an obstacle. The important thing is to let go of mind and body and take refuge in truth itself. It is a matter of pemitting yourself, all you can, to recognize truth, to sincerly live in the now, here which IS your life. If you see only the differences between yourself and others, you feel easily irritated, overly sensitive. If you're out to take care of just your own little self, guard your own little castle, protect your own separate existence in whatever way you can, it'll all eventually just go under anyway, won't it? So go back to the starting point, return to your true home, the home which is the same for every single being in this world. I want to see you awaken to your true self. Partial script from a conversation with Harada Roshi at Bukkokuji by TakashiAoyama, published in the monthly, Kongetsu no Tera, July, 1984. All footnotes are by the translator, Belenda Attaway, with the Roshi's permission. Shoin Yoshida's preparatory school attracted many of the brightest and mostidealistic youths of the later Tokugawa Era. Some of these students became greatpolitical leaders instrumental in the establishment of the Meiji Restoration in 1868. When asked if this experience could properly be called 'kensho', the Roshianswered that it was not 'kensho', but could be called 'kangi'. The word 'kangi' iscomposed of two characters, both of which mean "joy" or 'happiness'. The Roshi described it, "Deep glad. Alive." When the apparent ease of this first experience, which occurred without going through any of the rigors of formal training, was pointed out, the Roshi explained that his childhood situation must have been an influential factor. His mother died when he was born, and he was not raised in the most favorable of family conditions . If one loses his mother, the very essence of protection for most children, he is bound to search for something he can truly depend upon. He had a deeply sad childhood and was always a particularly sensitive youth. When it was mentioned that reading this interview might even be discouraging to those for whom such experiences might not come so easily, the Roshi chuckled and pointed out that this was just a friendly chat over tea and cakes and that whatever came out of it was not planned. The intensely hard training under various adverse conditions, including several years of critical illness, did not happen to come out. The Roshi did return to mount Kinpoku subsequent to this interview. He paid a visit to the mountain on his sixtieth birthday, an especially important occasion in Japanese culture. When he returned to the temple, the Roshi most enthusiastically and merrily reported two things. One was his astonishment at how long it took him to make the climb this time as compared to that day some 42 years earlier. The other was his wonder at a beautiful flower he saw on the surrmit. When asked if he would go to war now "propelled by the spirit of helping others," the Roshi immediately answered, "No. I am definitely opposed to war." After he began training, he said that he came to understand that all hurman beings are brothers and sisters, and "Even if you're to be killed, you won't kill another." When I was young, I went to war as a kamikaze pilot. I had firmly made up my mind to give my life because I wanted to protect my parents, my brothers and sisters and my friends. Other pilots went before me, giving their lives in that final flight. I waited my turn. My turn did not come. The war ended just when I was about to fly. I was devastated, because I could not carry out my commitment to help. I wasn’t able to serve. I felt useless. All my comrades had given their lives and here I was, still alive, to what purpose? After that, again and again, just on the brink of death, my life was miraculously spared. You too are perfectly protected. It just isn’t obvious to you. You are receiving all the care, protection and guidance and love of all the universe. You just haven’t been able to see it yet, but you will. Before I started my zen practice, my life was spared over and over again, and yet I couldn’t rejoice in life. I couldn’t appreciate it, not then; I felt only anguish and despair. Those who had died… Was their death in vain? Did they die, and that was it? These questions stayed with me; they took over my mind. It was during that time that I was fortunate enough to be given an audience with the great master who was to become my teacher, Daiun (Harada Sogaku) Roshi. He told me, the first time I met him, that he understood my suffering. He told me that I could come to be in peace. I had sought to help those of our own country. I still wasn’t able to see beyond the narrow category of my own countrymen. My view was still so very, very limited, but he told me, that first day, that life does not end with the death of this body, that true life does not disperse like a mist, and that by knowing true life you can be at peace. My teacher told me: ‘You yourself, you are still alive, so that you can forever and ever follow the path of giving. You can steadily for evermore give your life to save others.’ Even with the death of this body, the genuine life continues. There is something that does not die. My teacher told me that if I really wanted to understand the meaning of life, eternal life, that it would take all the determination and effort that I could possibly muster. Without thoroughgoing single-minded determination and effort, you will not be able to know truth; you will not be able to find the solution to your question, your problem; you will not realise truth if your aim is unclear and if your practice is weak. If you continue to think along the lines that you have given all you could possibly give, you won’t make it. You must continue, continue this one doing. He told me, as I tell you today, that your resolve must be absolute, you must be prepared to persevere with single-minded conviction and effort. I knew then that I would carry it through. Will you carry it through? That is not to say that it was always easy for me. I struggled mightily, as you struggle. But I stuck with the practice — the one single way of practice — and made no excuses for myself. I did not allow my practice to fade out in feelings of discouragement. There were hard times. Even times when I thought I was not going to live through it. But I stayed with the practice, no matter what. And this is what each one of you must do. There were times when I could not breathe, times when all went dark before my eyes, times when I thought I was going to pass out. But even then I refused to give in to my old self-centred patterns of behaviour. I did not try to adjust the practice to do it my way. I stuck with the simple practice that was given to me. There is a stone here in the graveyard upon which these words are carved: ‘We were once just as you are now. You will become as we are now.’ How is that? The fact is, everyone passes on. Impermanence is swift. No matter how blessed you may feel in your present circumstances, how easy-going, how secure and pleased you are, you cannot hang on to that world. It will be jerked out from under you. Impermanence is swift. The lining of your present life is death. The problem of life and death is no one else’s problem; it is yours to deal with. And then there are the many desires. You can’t get what you want; it never seems quite right, never enough. Dissatisfaction and frustration seem to surface. There are so very many people who worry about what would seem to be no problem at all. Liberation from suffering. The more you know of this world, the more you see it to be a giant exhibition of suffering. Everywhere you look, you see plenty of examples of misery. What about you? Have you no pain, no suffering, no worries, no fears? If you honestly think: ‘Hey, not me. I can meet it as it comes, go with the flow. I am not afraid; I can always be at peace,’ then you are fooling yourself, giving yourself license, seeing yourself for what you are not. You are caught up in a ‘self’ notion, clinging to an ego idea. And lost in that ‘self’, you cannot hear the cry or see the tears of others. If you can overlook those tears, you are not a person of great peace of mind. The depth of truth is bottomless. Your interconnection is bottomless. A single grass in the field is perfect Buddha. How utterly ONE are all things: the grasses, the trees, the great earth, the great sky. All being is born in relation to all things. This is the true self, the perfect self. No matter what, all is goodness. However, because of deluded perception, beings fail to realise their inherent Buddha-nature. Truth is universal and complete. Can you receive and embrace thoroughly this one truth? There is something urging you to look deeper, something which seeks to be known. Don’t you see it yet? Isn’t it clear yet? You are sitting here because you cannot help but seek truth. The genuine seeks to know itself. Truth is seeking truth. That is why you are here, putting your heart and soul into meditation. Your time of awakening will come. No one is hopeless. Life is not mean. No one is left out. There is no one who is more or less Buddha than any other. True nature is never lost, never hidden from you. It only seems that you have to go looking for it. But you have had long lifetimes of fooling yourself, protecting self-cherishing. When you come to life again, to awakening, it will be so clear that there is no ‘self’ and no ‘other’. There is no opposition; there is just this one reality. What appears as opposition is simply the result of a self-centred view, which is of course an incorrect view. This bad habit and wrong view causes untold suffering for yourself and others. And you will continue to create suffering as you go on living in falsehood. You will continue to experience suffering, fear, a sense of lack, and you will not be helping anybody. What you think you are, who you think yourself to be is so entirely mistaken. By grasping ‘self’ you obviously fail to see who you really are. You try to hold what cannot possibly be held, for where is there anything fixed? Change is swift. Because you try to hold on, you feel much anxiety; it’s inevitable. In those circumstances, how could you know true satisfaction? Dissatisfied, you look restlessly over here, over there. Your base camp is ‘I, me, mine.’ You grasp it, you seek to rely on it, but you are relying on a phantom. You grasp this phantom-self and ceaselessly try to satisfy it. What lengths we go to, in order to gratify the self! We get what we want for a time and then we lose it, up, down, up and down. We try to rely on our clever thinking. How could there be any true peace of mind? How could you even begin to give to the great universe as you receive? Your compassion could only remain half-baked, locked as you are in ‘I, me, mine’. If you are doing your practice because you have determined to receive life as it is, to come home to life, then you will meet true self. We human beings rely on our discriminating intellect. How arrogant we are! ‘This is mine; this is what I deserve; credit should come here; this is the way it should be.’ We compare and contrast, and in so doing shrink our world to something very small. We get so down on ourselves, feel so very sorry for ourselves. Or, in turn, we are proud of ourselves. We wonder why the world doesn’t turn as we think it should. We become so dark and down, and then we joke in order to cover our insecurities. Lost in ‘self’ we can’t help wondering: ‘Where is the value of this, what am I doing this for?’ We wonder if there is any meaning in what we are doing. What about you? Are you clear, crystal clear about what you are doing? What are you living for? Birth, ageing, illness and death come quick. Your world as you know it, is pulled out from under you in a flash. It seems like no time at all since I first met my teacher, Daiun Roshi. I could only judge the world then by my own deeply held beliefs. To see the beauty, we have to break through such beliefs. Some fifty-five years have flashed by since then. And now, here, the universe is embraced in the One. I can assure you that all is well. All eternity is now, here. Bold, clear, dignified. Now, here, it is so vivid, so alive, so filled with joy, and waiting for you to see it. ‘I will do whatever I can to benefit others.’ This is just life as it is, naturally. Please, please see it: everything is alive. Great, greatly alive. This is the happiness of all happiness. And this ‘now here’ can never be destroyed. The light of your eternal life is shining brightly, now. What joy there is in this radiance! Please, take care of yourself, your shining Buddha-self. Become for evermore able to appreciate your Buddha-self. That is not to say you become arrogant. There is no one to feel small, no one to be made small, no one to feel superior, no one toward whom you could feel superior. Who are you to feel vain and proud when your very source is all being? You are supported, you are nurtured, you are guarded by all being. Thanks to all being, together, one, is the universe. This breath is breathed, so close, always one, always together. Please never forsake the limitless treasure which is you yourself. Be in touch, simply do not look away. Grasp nothing, hold nothing. There is just now, here, fresh, new, alive. Just do your practice with good grace. died on the 12th of March, 2018. 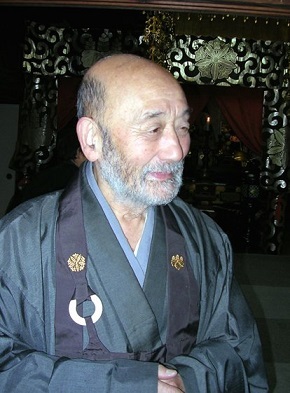 Harada Tangen Roshi, one of the great Zen teachers of Japan, has died aged 93. Having survived WWII as a kamikaze pilot*, he adopted the practice of Zen Buddhism, eventually becoming a teacher to thousands of students worldwide. He was a warm, kind, spontaneous man who devoted himself to teaching meditation and sharing his insights into life. He emphasised the central Buddhist teachings of mindfulness, simplicity, compassion and selflessness and implored his students to lead a life devoted to helping others. Tangen was born on 24th August 1924, in Niigata Prefecture, Japan. His mother had been warned that she would not survive the birth of this child and so was advised to abort the pregnancy and save herself. She went ahead nonetheless and her subsequent death would be Tangen’s first experience of true sacrifice. For the rest of his life he believed that his mother protected him. In 1944 Tangen volunteered for the Japanese Air Force as a kamikaze pilot and completed one year of intensive training. On 15th August 1945 he prepared to make his final flight from Harbin in Manchuria, China. After the traditional cup of sake, he was about to board his plane when Japanese Emperor Hirohito’s voice announced over the loud speakers that Japan had surrendered. Tangen remembered running down the runway, screaming in anger and disbelief, unable to comprehend that he could not complete his mission of sacrificing his life for family, friends and country. Following the war Tangen was interned in a Russian POW Camp. One day a Russian Officer invited him into his office, placed a bottle of vodka on the desk and suggested they drink. When Tangen declined, the officer pointed a gun at his head and demanded that he drink. He drank so much he became very ill and had to be hospitalised. During this time the rest of his group was transferred to another camp in Siberia where they all perished. Though he never drank again Tangen remained forever grateful to alcohol for the role it played in saving his life. Tangen returned to Japan in 1946 suffering severe mental anguish. Despite surviving the war he felt only despair and pain at the loss of his comrades and the apparent meaningless of their deaths and confusion about the purpose of his life. Someone suggested he visit a Zen Buddhist teacher named Harada Sogaku Roshi** at a temple called Hosshin-ji in the town of Obama, about 100 km north of Kyoto. Hosshin-ji had, under the guidance of Sogaku Roshi, gained a reputation as a place of strict Buddhist practice. Sogaku Roshi did a great deal to revive authentic Zen practice in Japan during the early 1900s and would exert a profound influence on the way Zen Buddhism has been transmitted to the West. At their first meeting, Tangen realised he had met someone who could help him. Sogaku Roshi told him that he understood his suffering but that he could come to understand the purpose of his life and that he could know true peace. He told Tangen that his comrades and friends ‘had not died’, they had ‘not gone anywhere’, and that if he practised hard enough, he would realise this for himself. Sogaku Roshi said that if he was prepared to become totally selfless, then he could solve his problems and answer the questions he had about life and death: ‘He said that if I really wanted to understand the meaning of life, eternal life, then it would take all the determination and effort that I could muster,’ Tangen later recalled. With this in mind, Tangen hurled himself into his practice with fierce determination forsaking all physical comforts in his quest to understand Sogaku Roshi’s teaching and the true meaning of Buddhism. For the first three years he refused to lie down to sleep, instead sitting in meditation through the nights. At one time he was so disgusted with his own self-centredness that he punched himself in the face and dislocated his jaw. Tangen practised under Sogaku Roshi at Hosshin-ji for ten years, eventually ordaining as a Buddhist monk. 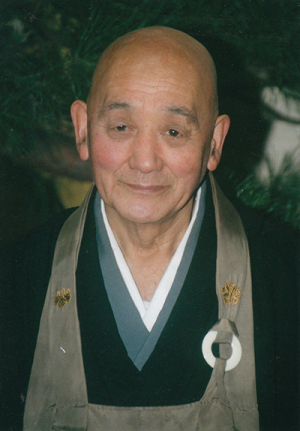 In 1955, Sogaku Roshi formally recognised Tangen’s understanding of Buddhism and appointed him a Zen teacher. He sent him to the nearby dilapidated old temple of Bukkoku-ji to continue his practice and begin teaching. The then 31-year-old Tangen rose at 4 am each morning for meditation, spent the days rebuilding and repairing the temple, conducting ceremonies, going on begging rounds to raise money, before sitting in meditation until late at night. People interested in Zen Buddhism and meditation began arriving at Bukkoku-ji, from all over Japan and then gradually from around the world. Tangen accepted anyone, including foreigners and women, who wanted to learn and practise Zen meditation. He freely shared his teaching and insights and provided the tools and environment to enable people to achieve their own understanding. The practice was strict and intense. Tangen drove his students hard, encouraging them to let go of their self-centred thoughts, to practise contentment and gratitude for everything, and to devote themselves entirely to the present moment, the ‘Here and Now’. He would repeatedly remind his students that ‘all life is One’, ‘everything is Good’, and that ‘there is no separation between “self” and “other”, no “birth” and no “death”’. He emphasised the importance of ‘waking up to True life’, of seeing life ‘as it truly is’ rather than through our self-centred discriminating minds. He tolerated no selfishness, and instead encouraged everyone to live a life devoted to helping others. He was a simple, kind, happy man, who lived his teaching. Tangen Roshi taught and practised at Bukkoku-ji for almost 60 years. During that time thousands of foreigners and Japanese spent time with him, some for just a few days or weeks, others for months or years. He also received a constant stream of guests and visitors who sought his advice and help with every conceivable problem and difficulty. His teaching struck a chord with almost everyone who met him and, not surprisingly, resonated deeply with westerners searching for truth, meaning and happiness in life. In his 70s Tangen began suffering from Alzheimer’s and various physical ailments, though he continued to teach, give public talks, receive guests and conduct ceremonies until his mid-80s. He died on 12th March 2018. When asked one day what happens at death he replied, ‘absolutely nothing’, and that in reality there is no birth and death, that life does not give and then take away. He would remind his students that although his body may die, he was ‘not going anywhere’ and that we are all ‘eternally young’. With the decline in genuine Zen practice in modern Japan, authentic teachers have become increasingly rare. Harada Tangen Roshi was one such teacher and he will be mourned worldwide.